If I were honest with myself about my closet, I would probably only keep half of what is in there. So much goes unworn for months, even years, but I can't let it go. I like both these pieces, they fit, they aren't uncomfortable, or unflattering, yet both sat for unworn for over 16 months. Does it make sense to keep things even if they only get worn once a year? Should my focus be on a more concise closet, or can I just allow myself to continue on the path of cheap (thrifted) sartorial thrills? P.S. Full disclosure: I bought two dresses I did not need at a consignment store sidewalk sale this weekend. One is a strapless beachy maxi that screams 'resort', so there is a chance I might not even wear it this summer. 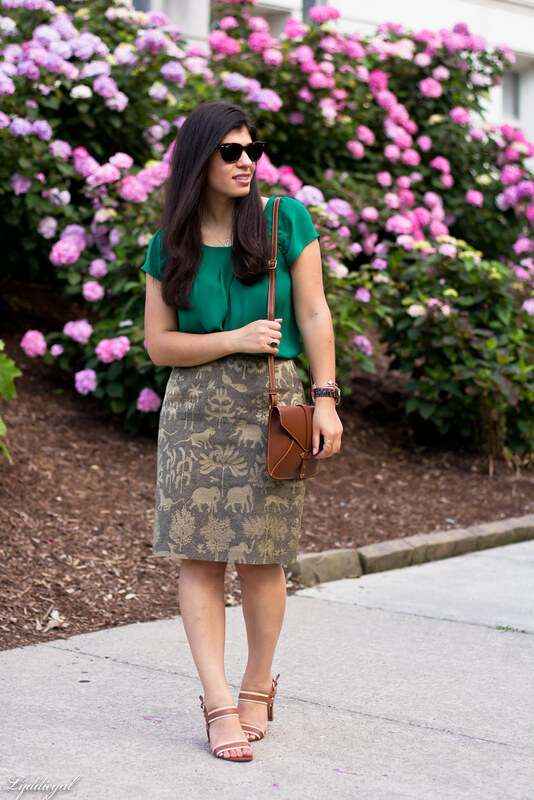 Love the skirt and it looks great with the green top! I need to get rid of so many clothes. I really need to have a closet blowout sale and whatever doesn't sell donate. I feel the same way about my closet! I have so many things that I consider selling or donating and then I just keep it. I never wear it, yet there it is. I also seem to keep buying pieces like that as well! 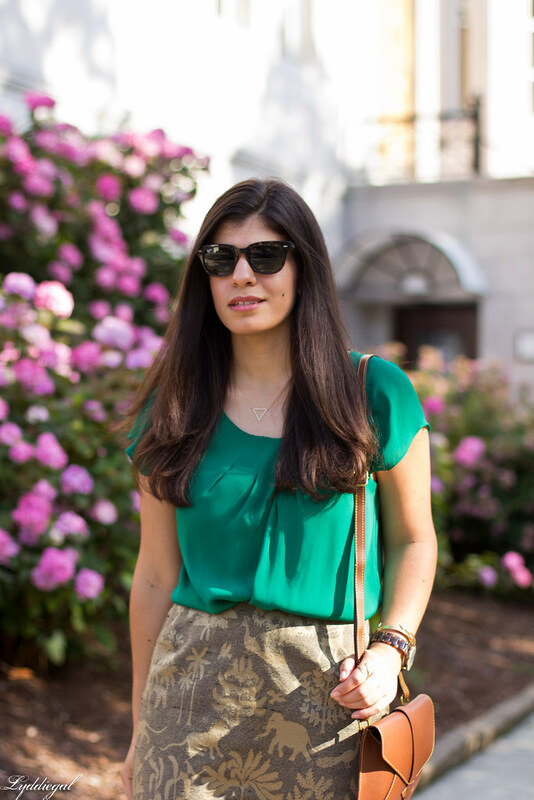 I love that skirt and I love the green top you added! 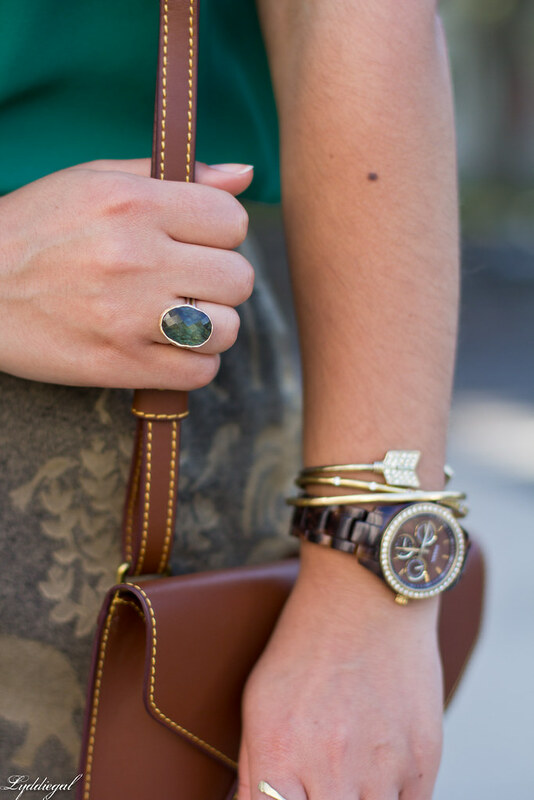 Your skirt is so cute - I love the fun print and safari vibe! I try to let go of pieces I don't wear, but I totally admit to having some I just cannot get rid of. Love the dressy feel of your skirt. What a fun skirt. 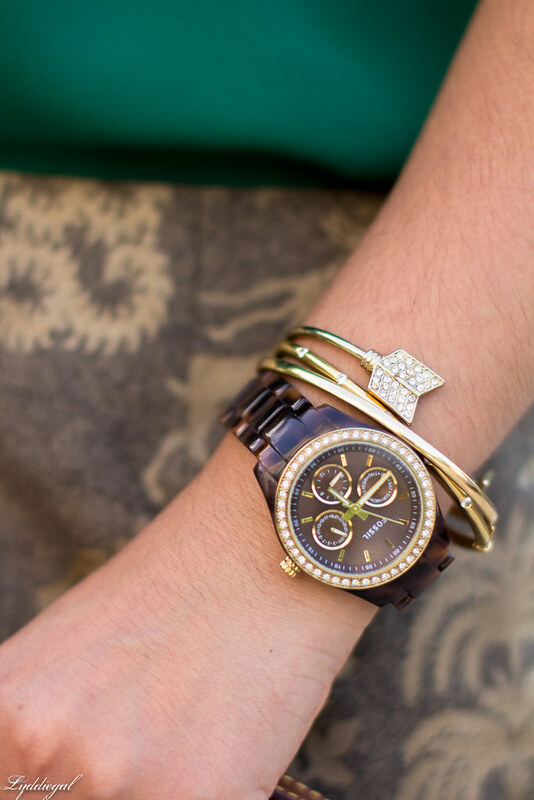 Love the elephant print. I also have certain items in my closet that I just can't part ways with. It always makes me feel good when I find ways to wear them again! 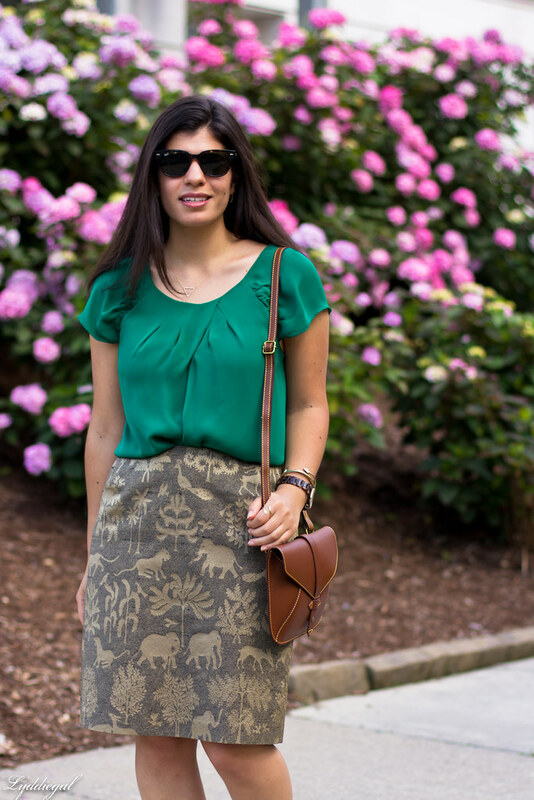 So cute, loved that you paired the elephant skirt with a bright color. You look great. such a fun print on that skirt! And I know how you feel about not wanting to letting clothing in your closet go, it's such a struggle! Some people can get away with having only a few pieces and wearing them over and over, but I could never do that. I do a good job with getting rid of things that I don't love anymore, but I also have pieces that I've had for years. There is nothing worse than going to grab something that you sold or gave away. 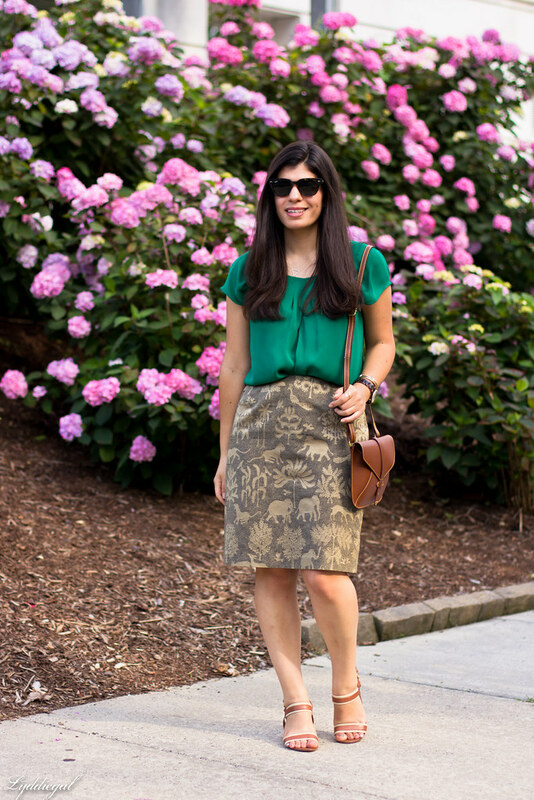 I think you should keep this elephant print skirt forever. It is so unique. That is exactly how I feel about my clothing. I really have been going on purges lately. I do sell some of the stuff that I don't wear and use that money to buy better classics than what I wasn't wearing before! Beautiful color combination! That skirt is outstanding! I love that blouse on you. Also, I am all about minimal closet lately. I only keep things I wear, love and look good on me. Have a great day, sweetie. 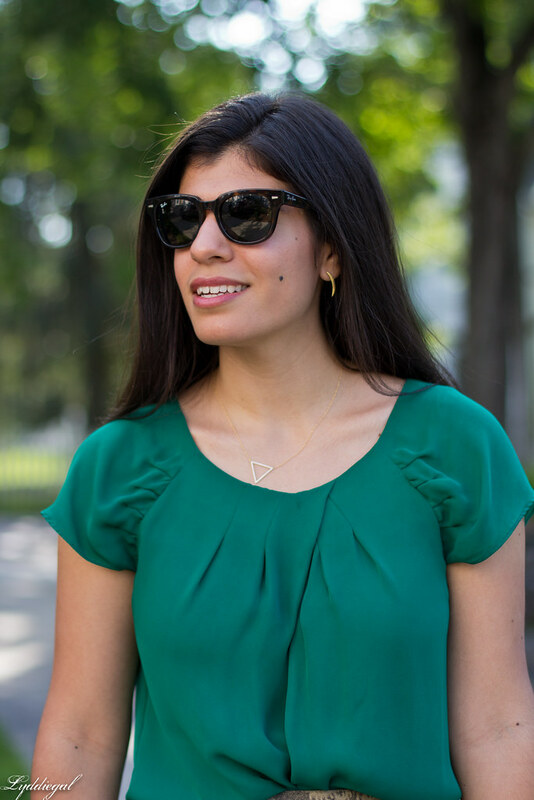 I love your arrow bracelet! It's so pretty! That top is such a beautiful color on you! I can't believe it's thrifted! I never have that luck! This is such a unique skirt, I love it and would definitely keep! I was the same way about my closet for the longest time, before I finally couldn't stand it anymore. I had stuff literally in three different closets! Multiple yard sales, trips to Goodwill, and putting stuff on Poshmark later, I now have everything down to one bar in one closet. It feels so much better! I have a few things I won't part with (some vintage pieces I know I could never replace, my wedding dress and shoes), but otherwise I found it quite easy to part with stuff. Well I love that skirt, I think it's a keeper. But I think that's such a hard thing to decide. If you have the space and it doesn't stress you out to have lots of clothes, I don't think it's a bad thing. However when you're running out of space and have a hard time finding half your stuff or feel overwhelmed about it all (that was me) it may be time to purge some of it. Also, how do you know how long it's been since you've worn something?